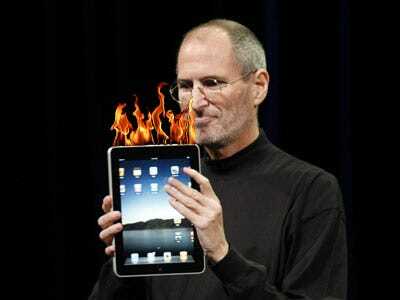 Apple Selling 20,000 iPads Per Hour? Update: New estimate says it’s at 74,000 iPads in the first 4.5 hours. Story here. Original: Here’s the first attempt at figuring out Apple’s iPad pre-order sales we’ve seen yet. Based on order ID numbers, Andrew Erlichson, CEO of photo sharing website Phanfare, thinks Apple could be selling 20,000 iPads an hour, which suggests iPad sales of around $10 million per hour today. We just bought two iPads, about 30 minutes apart. Our order IDs are 10,000 apart. Assuming those order IDs are sequential, and they appear to be, then Apple is selling 20,000 iPads per hour. Assuming most orders are for the $499 model, and that people are only buying 1 per order, that means Apple is selling $10MM/hour. Of course that is not sustainable, but if they did it for a year, it would be $87.6B. Now, of course, we can’t be sure every order was for an iPad. Apple does sell other stuff. But at 830am in the morning on the east coast, my guess is that most of the orders were for iPads. This also means that Apple will sell out of all devices built in the initial manufacturing run sometime this week. This product will change consumer computing.